Follow these guidelines for the recommended deployment configuration. Data throughput depends on the number of nodes, CPUs, and partitions, as well as the replication factor and bandwidth. For the consumer, the replication factor is not important because the consumer reads from the leading partition. By default, the Kafka cluster stores data for seven days. You can change that time by overriding the log.retention.hours property. For more information, see the “Overriding Kafka server.properties settings” section in the Kafka common configuration options article. Your goal is to process 100,000 messages per second, 500 bytes each, and to keep messages on the disk for one day. The replication factor is set to 2. 3GB is used in one minute for a single copy of the data. 6GB of disk space is used in one minute due to the replication factor of 2. The total throughput is 360GB in one hour and 8.64TB in one day. Apart from your data, the Kafka cluster uses additional disk space for internal data (around 10% of the data size). In that sample scenario, the total minimal disk size should be 9.5TB. GZIP requires less bandwidth and disk space, but this algorithm might not saturate your network while the maximum throughput is reached. 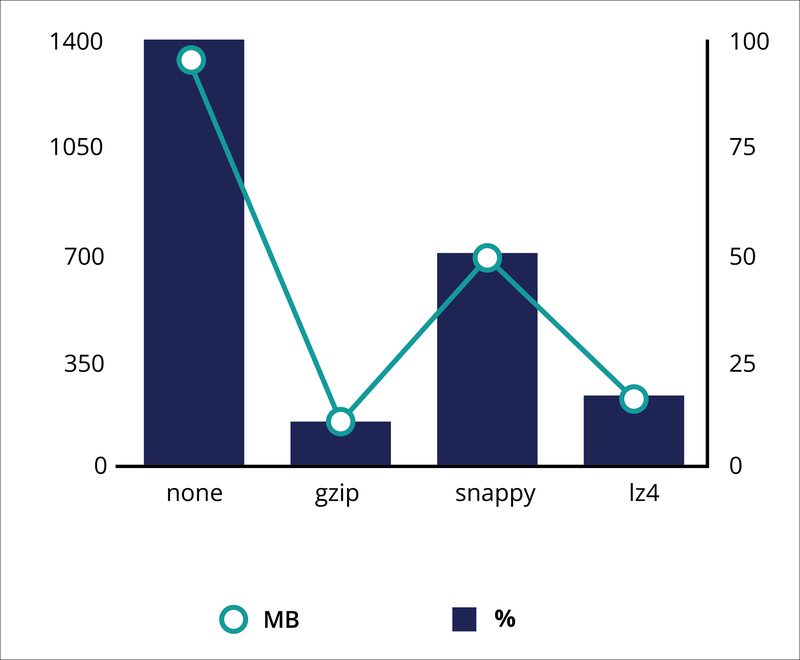 Snappy is much faster than GZIP, but the compression ratio is low, which means that throughput might be limited when the maximum network capacity is reached. To define the compression algorithm, update the compression.type property. By default, no compression is applied. Ensure that you set up that path to the location with enough disk space. For more information, see the “Kafka commit log location” section of the Kafka common configuration options article.